Fancy Bands™ Custom Themed Baseball Garters and Custom Themed Basketball Garters in team colors on white or black lace. Custom Themed Rainbow Trout Fishing Garters with floating pearls and iridescent and cording bows. 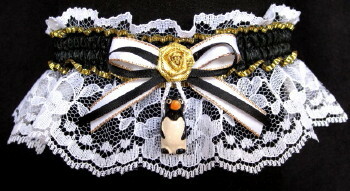 Custom Themed Penguin Garters all in black and white.